target audience is king, not the company. Relevant Content Marketing is a simple philosophy. It's centered on the only reason we are in business: the target audience. Other complications of running a business are certainly real. But they exist because of our only reason. And we solve business challenges with our only reason in mind. The target audience commands our attention. They expect that we use their language. So, we'll do best by paying attention to how we communicate with them. And that's our starting point. It's the only point: how we speak and write to them. Relevant Content Marketing is the philosophy of how we communicate with our only reason. What's always in question is the quality, accuracy, and consistency of the content we deliver to our audience. Relevant Content Marketing is intimately involved in these issues. Relevant Content Marketing is the quiver for our marketing arrows. Make sure your arrows fly true to your target audience! Before any other step, define your target audience. I created a tool to help do just that, called the CORTA planning tool. Content that's Optimized and Relevant for your Target Audience. It helps ask the important questions for creating personas. Profiles for each of your target audiences. Your business may market to more than one persona. As is the case in B2B transactions, there are different personas to deal with throughout the purchase approval cycle. You may have to write a certain type of persuasive document that targets the engineering community. And you might write a completely different persuasion document for management. All the other steps in the CORTA planning tool revolve around this single task of defining your target audience. The next steps of the tool rely on a completed target audience persona(s). I'll talk about those steps in other articles. And you'll start thinking about building those personas. For today, please pick up your free copy of the CORTA planning tool, and let's keep focused on the reason for defining your audience. And how Relevant Content Marketing serves that end. These values are highly related. Relevant Content is the guiding focus. It says that our words reflect the language of our target audience. It also says our content is nothing BUT words of our target market language. Or, they're helpful to that end. Most importantly, it says only hire writers who understand what it means to write for the web. Conversational Copywriting is the editing and writing function. It creates the content, amplifies it, and fine-tunes the words to the target audience. Websites and company marketing require this expertise. Content delivery with persuasive writing is a remarkable skill. Highly sought. Then we use Search Optimization to make sure our message is loud and clear. This is like taking a wrench to your car to make sure you win the race. Together, these 3 weave a complete plan of attack for creation of your marketing messages. Use this plan for your website, white papers, case studies, email marketing blasts ... all content. NOTHING but relevant, natural, and specific keywords are used on your website. And all your copy. Keyword and key phrase creation is generated by understanding the language of your target audience. EVERY piece of marketing and web page is written by authors who know market writing for the web. Teachers, journalists, and people who just like to write probably don't qualify. All web pages and every marketing piece created come from the same marketing game plan. Consistency will show very favorably to your target markets and to the search engines. All your market pieces are written with copywriting skills in mind. Hire copywriters, the original market writers. Hire those who've studied copywriting for the web. There's writing for interruption marketing (TV / magazine / radio advertising, etc.) which requires to break through a passive mindset. Then there's writing for the web, which requires coming alongside an active, searching mindset. Web writer copywriters are students of conversational copywriting. Most forms of writing are better when including conversational writing skills. But it's a different type of conversational writing for the web. 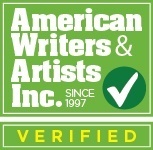 Writers with copywriting skills are generally raised on direct-response techniques. This is the ultimate in learning the art of persuasive writing. Conversational copywriting says marketing for the web is concerned with creating and maintaining good, mutual relationships. Honest communication skills concerned about relating with you as I write. Earning your trust. Persuasive writing combined with good web conversational writing equals great content. Hire a copywriter that knows how to pull the right arrow from the quiver ... and accurately fire it ... at the right target. SEO is an integral part of content marketing. Not separate from. Three SEO areas are critical for connecting with your target audience. 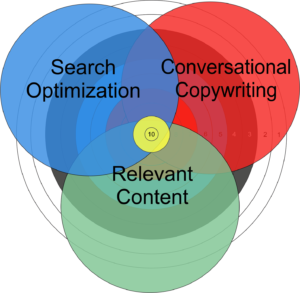 These areas encompass and serve the Conversational Copywriting function and Relevant Content philosophy. Search Optimization is the function that defines these three areas. It not only serves as a function, but also a checkpoint. These are in lock-step with the philosophy of Relevant Content. any other content, online or not. Visit this page for a full description of the SEO philosophy inside the Relevant Content Marketing philosophy. Download the free CORTA planning tool. Relevant Content Marketing is introduced, and the philosophy and instructions on how to use the included CORTA tool are found there. 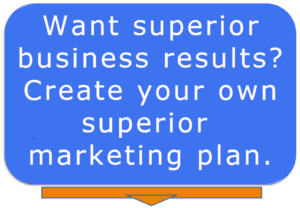 It's designed so YOU can begin to create your company's marketing plan. Begin planning your marketing strategy today. Don't let any other writer or agency do that for you, unless you're a part of the process. At minimum, you should check out this strategy for yourself. Make an informed decision based on the facts presented in the CORTA planning tool. 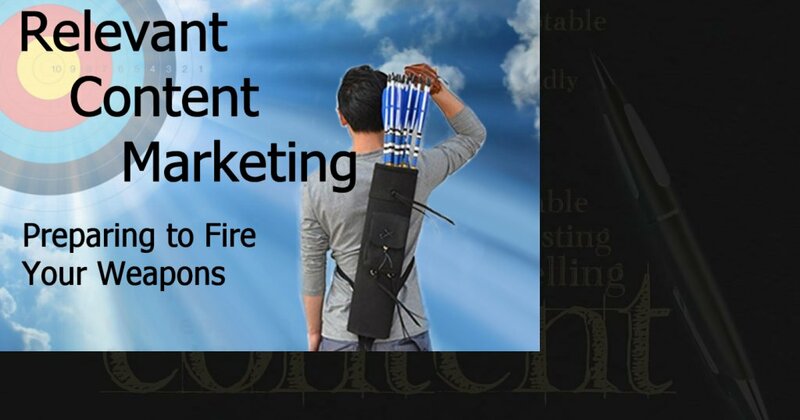 Relevant Content Marketing really is the only way to connect with your target audience. Do you agree, disagree? Tell me below.